Must be the time of year and another image bit the dust. Not that I was totally unhappy but I thought that the dimensions of the board didn’t suit the image which would be better on a larger canvas. The image was about a feature of Brachina Gorge termed The Golden Spike, a band of rock rising from the gorge floor part of a vertical curved ridge. Usually renewing a painting is a messy business however this time it happened very quickly, not the normal sequence of events. I poured on several tones of the purple pink landscape colour, having blocked out the area I wanted to retain, namely, The Golden Spike. I had in mind the long leisurely stroll along the gorge as my friend and I searched for fossils. 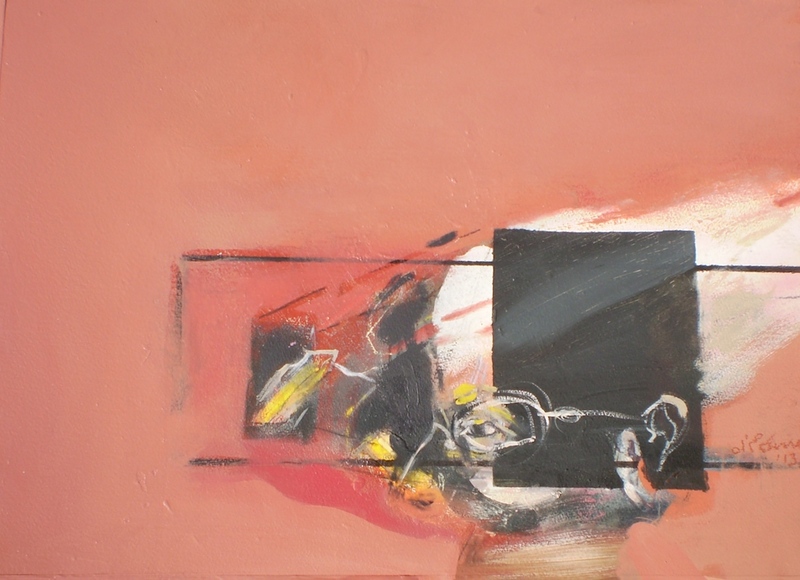 Instead of heads appearing in the composition as usual, the paint swirled into two figures. As I like to combine the real with the unconscious, a recalled dream memory that seemed to happen as the paint did the work with the figures merging into the landscape but at the same time partly separate in their own world, almost about to enter an arch of time back 500 million years. Categories: Oil Paintings | Tags: Brachina gorge, contemporary figurative | Permalink. Saved from the dustbin, just, but still out on probation. The original intaglio in black and white in the lower section of the image remained mostly unchanged, however, the multi layered problematic top area consisted of gold leaf covered with beige handmade paper. Not working so partly ripped it off leaving the small rectangular image of the partly revealed “golden spike”. I changed to horizontal format and added semi transparent handmade paper that allowed the underneath to show through producing a quite grubby atmosphere. I returned the composition to a vertical format and added some collage elements with the intention of conveying in this depiction the idea of a return to the gorge where it was difficult to locate the landform termed “the Golden Spike”. Categories: Mixed Media | Tags: Brachina gorge, etching collage | Permalink. 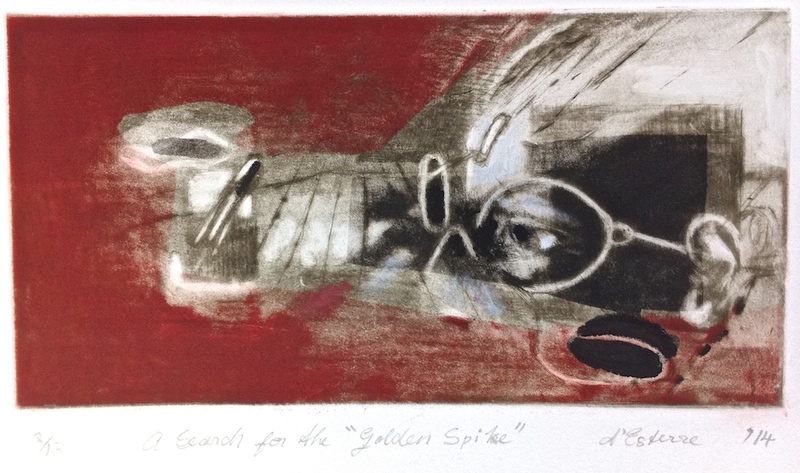 The slide show images, a variable edition of intaglio and chine colle, derive from the image below titled Search for the “Golden Spike”. The technique included masking out a section of the image when I inked and printed the second layer of the composition. The blank masked area received the ink from the etched surface in the second printing but was excess to requirement when printing the first etching. Later these ‘leftovers’ often combine with the first print as a way to create and develop further aspects of the composition. I did several mixing three colours and versions of the first image in different ways. Categories: Etching | Tags: Brachina gorge, collage, Etching, the golden spike | Permalink. When I place a head in the landscape-type of background I try to depict a momentary thought as it appears to cross the subject’s face. This process is about how I think and understand the way that time, the ages and history are recorded in rocks. For me gorge formations are like reading and imagining a story about the earth’s history. The Golden Spike mentioned in the artwork titles is a particular rock formation dated about 500 million years old located in Brachina gorge in the Flinders Ranges. This locale is also home to fossils that are examples of the first animal life. The head-images, abstracted and partially exaggerated anatomy meld with parts of the landscape as though the skull and earth’s crust both hold beneath them the forces of creativity and nature. 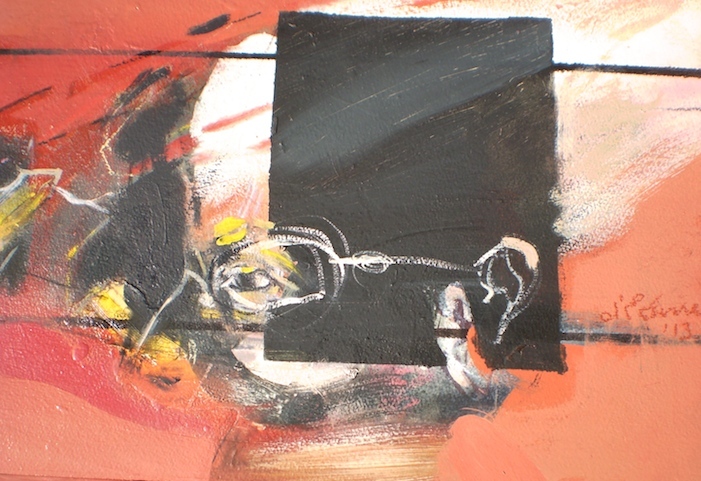 The abstracted shapes that seem to happen come from an imagined element of the thinking process. Categories: Mixed Media, Oil Paintings | Tags: art, Brachina gorge, contemporary, heads, landscape, oil painting, portrait | Permalink.